I love Peanuts! Charles Schulz's humor is so elegant and smart, and it makes you think quite a lot. The strip above is a brilliant example of his refined style (I've been looking that strip for ages and I finally found it on the internet!). 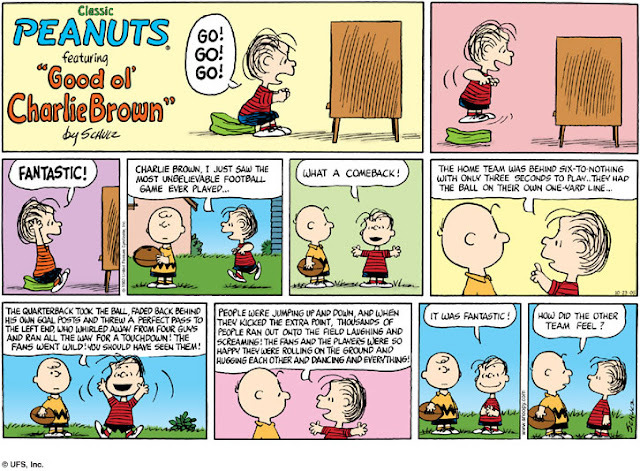 Charlie Brown's innocent but logic question "how did the other team feel" might have dampened Linus' enthusiasm, but it is indeed an invitation to reflect about some of the essential values our Western society is based upon, namely competition and individual achievement. One of the reason why I like running so much is the lack of competition. Family members see me sweating every day and don't understand why I don't take part in official races. "You could have won for sure! Why don't you compete?". Well, simply because I don't care. More precisely, I don't care to run "against" anyone else but me, and I am not attracted by trophies and accolades. In competitive sports we celebrate the winners as "heroes" and describe their performances as "historical". People tend to forget that their glory depends not only on their undoubted skills, but also on the "losers", those who didn't win and enable them to be in the spotlights. Honestly, I think that they deserve celebration, too. When I was in high-school and played basketball (many years ago) my trainer told us that if a member of the other team should accidentally fall down on the floor, well, you should keep on playing and make the most of the situation. Sport journalists would call such attitude "cynicism", an approach which is highly appreciated and it is seen as a sign of maturity and professionalism. I recall that the best players I met, besides being "cynical", looked really absorbed in the game, just as if nothing else outside the field existed. You could say that they were experiencing a sort of "agonistic trance". I have to admit that, right in the middle of the game, when I was handling the ball, I was often tempted to stop the game and hand the ball to the player standing terribly serious and threatening before me, saying: "Take it! It seems you need it much more than I do!". Of course such behavior would have cost me a direct expulsion from any court of the galaxy. But good ol' Charlie Brown would have understood, wouldn't you, Chuck?